Via Oilman, Findlaw, the largest legal website and lawyer referrer around is attempting to sell links to other law sites for $1000/month. The offer is quite shameless in how it explains and outlines how these links will benefit your site and improve search engine rankings. The problem is that this is a clear violation of Google’s policy against search engine spam, and these links will almost certainly be devalued when reported. (Google’s top cop, Matt Cutts has already taken note and commented in the thread at oilman’s site, so it appears to already be a done deal). So now it’s just a question of whether Findlaw will stick with the deal and deceptively sell these links that will no longer have any search engine rankings enhancement value. Why are Paid Links a Bad Thing? Links themselves are a key element of how the search engine algorithms rank sites. Links are like votes, and the sites with the most authority, or PageRank, have the most value, especially when topically related. So it would make sense that links from Findlaw would be extremely valuable to any site in the legal space. However, a link that is paid for is not considered an honest and unbiased vote. Therefore, when discovered, either by the algorithm or manually, paid links are discounted by google and other search engines, and given no weight in rankings. It will be interested to see what results from this, but it wouldn’t surprise me if some big legal players do pay the monthly link fees, and never realize that they are getting nothing for their money. Posted by dave on Thursday, August 14th, 2008 at 11:37 pm and is filed under scams, seo. You can follow any responses to this entry through the RSS 2.0 feed. You can leave a response, or trackback from your own site. As part of an occasional series analyzing the countless pitches lawyers receive for internet marketing, SEO, and related services, I present AttorneysDelivered.com. Here is the unsolicited marketing offer (yes, spam) I received from AttorneysDelivered.com, a lawyer directory listing website. My name is (removed). My company launched an attorney product/platform that was recently spoke of on LAW.COM/ALM’s official blog and other places so I am just reaching out to see if you are interested. It is a very inexpensive, PROVEN platform/profile that is serviced and designed to show up high on the search engines for important keywords, generate more customers, build valuable links that point back to your site, etc. . .It does a great deal for the price. . . and as a member of our directory, we will send you any relevant leads we receive. I am always interested in this offers, since in event that such a site had a legitimate value, I’d gladly be a buyer for many of my sites. But, not surprisingly, most of these offers are scams. And I do get asked by attorneys for help in figuring out who can be trusted. And, debunking can be fun. So let’s do it! Let’s start by analyzing the pitch and the information contained in this email. The email clearly states that buying a listing on their site will benefit your law firm in generating rankings and traffic to your site. Fair enough, we’ll look into that later. I don’t think an anonymous typepad.com blog post is a very good stand-in for an endorsement from law.com, even if it does appear to be owned by the same company. We’re not off to a great start here from a marketing perspective, but maybe this is just nitpicking their email pitch. So let’s be fair and dig a little deeper into the actual value offer this directory could provide for your law firm. From the web site http://www.attorneysdelivered.com/member-benefits.html we learn that benefits of being listed include branding and search engine rankings. Let’s break them down. According the offer, their page will rank well for your brand. 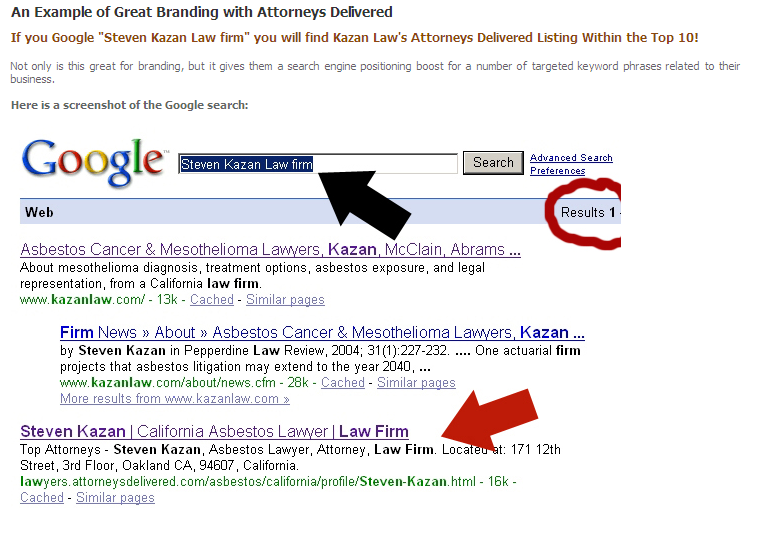 The example is on a Google search for “Steven Kazan Law firm”, their page shows up on Google’s first page. See their example image to the right. Anyone searching for “Steven Kazan Law firm” presumably wants to find the actual official firm web site. And they will, rightly so, right at the top of the search results. So who cares if there is another page related to the firm further down on the search page? This ranking is not a significant accomplishment, as the “competition” for this search phrase is extremely limited. They have a page about the firm, and all the keywords are in the title tag, so it’s basically a freebie. The term probably has no search value beyond the specific traffic to the firm’s official site. Are they such a big firm that they are a widely sought brand, and other firms might try to poach traffic from someone looking for their competition? Very unlikely. So, that’s a bust. Let’s move on to the next benefit of this legal directory listing. Here is something that could be of clear value: rankings for decent search terms, that could result in traffic to your site, and ultimately more business. The offer gives specific examples of rankings achieved by this site for a client firm for searches for “asbestos lawyer in alemeda ca” and “asbestos lawyer in oakland ca”. We will stipulate for the moment that these phrases have some significant search traffic that will could translate into valuable clients for a firm. (Many SEO scammers claim results for search phrases that have little real world value). For a real client, I would want to research how many searches are done on these phrases or similar phrases, but we will assume that they are decent, and have some value. 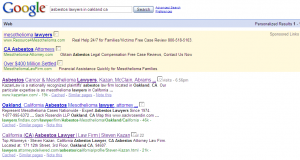 Google Search Result: "asbestos lawyers in alemeda ca"
So how does the benefit offer match reality? My search for asbestos lawyer in alemeda ca resulted in no hits for this firm’s AttorneysDelivered.com profile page as suggested. However, it did find their “lawyer pitch” page. Interesting, and probably fluky because of the specific word order, and prominent placement of their lawyer solicitation page on their site. Actual lawyer profiles are deeper in the site navigation, and may not rank as well. But even if this particular page stays in the rankings for this one specific phrase, it would not be a typical example of expected results for similar searches. 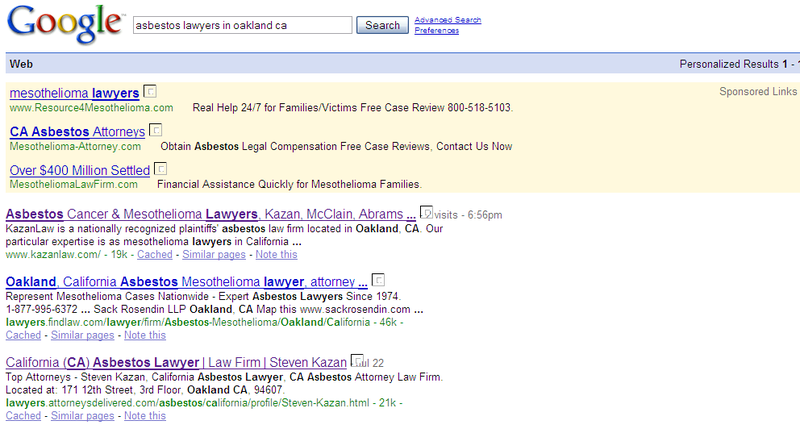 Google Search Result: "asbestos lawyers in oakland ca"
The next search is for asbestos lawyer in oakland ca. The results are more interesting, and more promising. The AttorneysDelivered page for Steven Kazan is the #3 listing, and the client’s actual site (KazanLaw.com) is the #1 ranked site. There is something going on here. But why is the firm site outranking the AttorneysDelivered page that is supposedly creating this valuable rankings benefit? A quick analysis of kazanlaw.com shows that it is an old site (registered in 1999), has a bunch of old backlinks, including valuable, trusted links from dmoz.org & the Yahoo directory. AttorneysDelivered.com is less than 1 year old, with a much smaller number of links to it. So from this (very) superficial analysis, it makes sense that the kazanlaw.com site is more highly ranked. And here’s the real kicker: if you look on the bottom of the home page of kazanlaw.com, you will notice a graphic and link to their AttorneyDelivered profile page. It would appear that the folks behind kazanlaw.com are either partners or benefactors of AttorneysDelivered.com. This is clearly a case of the tail wagging the dog. A valuable home page link from a well ranked, authoritative law firm site is driving the rankings of their own marketed profile page! And they are trying to sell it as if it’s the reverse. There is no question that AttorneysDelivered is making a deliberately deceptive pitch here. They are claiming benefits to their listings that does not exist. It’s always possible that there may be traffic value for a law firm listing on this site, but given the evidence established here, I would not trust the people behind this at all. To be avoided. UPDATE: Attorney Ben Glass believes attorneysdelivered.com might be violating ethics rules for lawyer advertising. Yet another reason to avoid this offer. UPDATE2: A week later, I’m still getting this identical spam email, complete with broken embedded links which I didn’t even mention before. But they did at least fix the spelling error on the sample profile page. Posted by dave on Wednesday, July 23rd, 2008 at 9:43 pm and is filed under scams, seo. You can follow any responses to this entry through the RSS 2.0 feed. You can leave a response, or trackback from your own site. Lawyers get pitched online marketing proposals constantly. If you are an attorney, you already know this, you are spammed and cold-called practically everyday. Claims of getting to the top of the search engines, or getting listed in a directory that will bring you traffic and clients are abundant. And the reason why, is that sadly, they work. That is to say, they work at separating lawyers from their money, but most often not at actually getting you clients. Lawyer leads are valuable. Acquiring a client is worth hundreds, and in many cases thousands of dollars. There are many lawyers out there competing for business. There are countless lawyers competing for the same business. Some are desperate and willing to try anything to bring in more business. How Can you Know Who Can Deliver the Goods? Some directory or lead services will offer you a free listing or free leads for a period of time. That way you have an opportunity to find out what value is being delivered. find out if you really getting calls, and hopefully, clients. Talk to Other Lawyers or Unbiased Lawyer Marketing Experts. For a service that may have high setup costs, or simple won’t offer a sampling period, you need to tread very carefully. If you know any other attorneys using their marketing services, find out if they think it is valuable, and they are getting their money’s worth. Try to talk to lawyers who have a similar practice to yours, but in a different region. If you are on a trial period for any legal marketing service, it is very important to track where your calls, emails, and clients are coming from. You need to be able to assess and re-evaluate your marketing programs all the time. You can do it as simply or as elaborately as works for you, from a sheet of paper, to an excel spreadsheet, or a complex lead tracking database. But the important thing is that you always ask the question: How did you find us? Posted by dave on Tuesday, May 20th, 2008 at 11:49 am and is filed under scams. You can follow any responses to this entry through the RSS 2.0 feed. You can leave a response, or trackback from your own site. I am always amused by Search Engine optimization scam artists who spam people with bold claims about how they can get you to the “top of the rankings”. Unfortunately, these scams are probably somewhat successful, since the claims often seem plausible if you don’t quite understand how they work. And certainly, the demand for these services is there. But the fact is, if these people could provide a real service that could help you, there is no way they would be spamming you to get your business. There are certainly people out there who provide a genuinely valuable service. However, internet marketers and SEO specialists who know what they are doing are swamped with business. They get all the referrals they need from delighted clients. I was looking at websites under the keyword "keywords"
and came across your site yourwebsite.com. I see that you're ranked 35 on page 4.
reaching out to a list of your "keyword competitors"
targeted website traffic this can deliver. Additional smoke blowing continues, but you get the idea. I am particularly pleased to be the “favorite” among the anonymous people spammed. The amusing thing is that, this is a top ranked site that does very well. It is #1 for many of the most desirable search terms in that market. But they did manage to find some particular keyword combo that apparently I rank on page 4. (Actually didn’t even check, since it hardly seemed important. ) And obviously, you can’t be top ranked for every imaginable keyword combination. At some point there are diminishing returns to chasing too many specific keywords in terms of overall breadth of scope and quality and quantity of traffic. There are a number of ways these scams plays out. If they promise “first page rankings for hundreds of keywords”, you need to know exactly what those keywords are, and how many searches are actually made for those keywords. For example, if the list of keywords search phrases includes things like “Criminal Defense Lawyer Jane Attorney of Beaumont Texas”, you can assume that a) this is not a competitive or difficult term to rank for, and b) almost no one is likely to be searching for it, so the value is negligible. The bottom line is, ignore unsolicited spam emails with claims that seem too good to be true. Particularly those with significant upfront costs. Posted by dave on Tuesday, April 15th, 2008 at 8:54 am and is filed under scams. You can follow any responses to this entry through the RSS 2.0 feed. You can leave a response, or trackback from your own site.